Gimme a Sign is a Duel minigame played in Mario Party 7. Its name comes from the plaintive saying "give me a sign", which is a way to request guidance from a higher being. The players are on four floating rafts, each of which has as image on it. A Shy Guy holds up one or two signs with any of images that appear on the rafts. The rafts with the images that are on the signs Shy Guy holds up, sink. The signs change more rapidly as the minigame progresses. 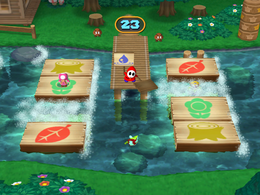 If one of the players falls into the water, they lose and the other player standing wins; if both players can stay in the game for 30 seconds or if both players fall into the water at the same time, it ends in a tie. Rules – "When Shy Guy holds up a card, that board with that design will sink. Don't be on it when it sinks!" Advice – "Sometimes Shy Guy raises 2 signs at once! Keep your eyes open!" This page was last edited on March 30, 2019, at 00:32.